We’ve had the odd bit of new snow over the last few days but nothing more than a few centimetres. We don’t really need much more snow now to be honest. Things are shaping up nicely in the snowpack locally. It has been windy though, so there is a risk of some wind slab formations and we did see some evidence of that on this tour. Luca, a friend from Chamonix, has come up for a few days to check out Norway and Lofoten for the first time. The weather has been more than a bit frustrating since his arrival and everything we have tried to do has ended up in complete white-out at the summit in strong winds and snow, hoping for a weather window. The weather had been shifting all day and it looked like nothing was going to happen. Hoping things had settled down a bit and would improve, we went for it. Of course that never happened and we ended up waiting on the summit in a complete white out with strong winds and snow for about 1.5 hrs unsure if we had found the entrance to the couloir. Finally a window of sorts presented itself and we could see the entrance (indeed where we thought it was) and dropped in. And well worth the wait it was too! 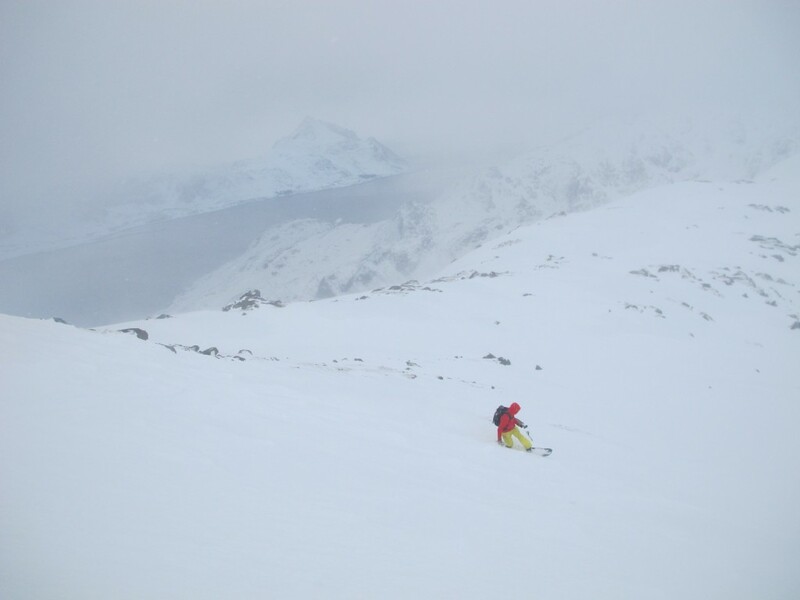 The conditions in the couloir were fantastic. Really cohesive snow and things seemed to be really well bonded. You could ski it pretty fast. Luca finally managed to get his first line. Let’s hope for a few more in the coming days. The couloir is protected from the current wind so there is no windslab. But as a result, it does have wind transported snow in there. I couldn’t see any signs of instability but it is something to bear in mind. This entry was posted in Lofoten, Norway and tagged Backcountry skiing Norway, Lofoten skiing, Luca Pandolfi, Splitboarding Norway, Stornappstind. Bookmark the permalink. I am new to Lofoten and would love to put my split to work… know of any good places to go to meet people to ride with? Good to hear from you. I’m a bit green as to the ski scene in Lofoten myself to be honest. When I skied here for the first time last year, I never saw another soul anywhere. This year, I’ve seen a few more people. Most of my skiing has been around the Leknes area which I get the impression is not quite as popular as some areas here. 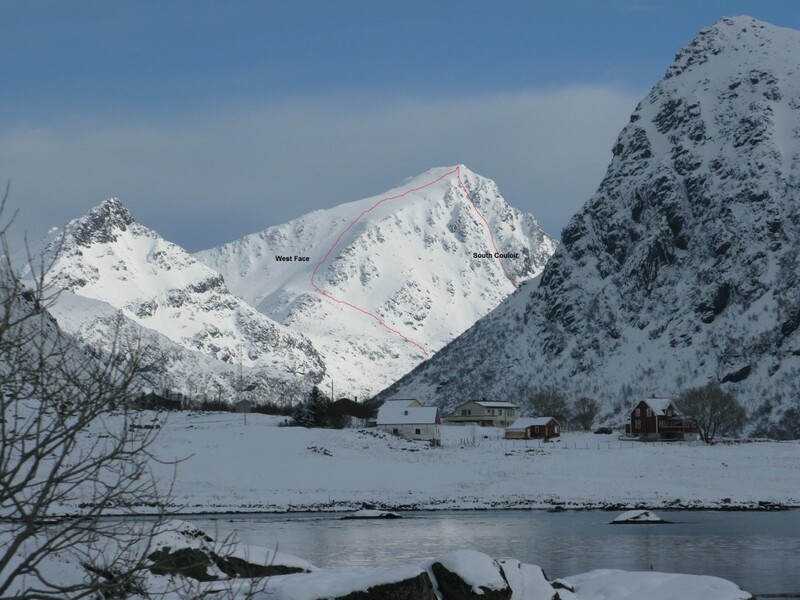 It seems that most people who come to ski in Lofoten tend to gravitate towards the Svolvær/Henningsvær area. I know there is a climbing school there (Henningsvær) and there are a few guiding outfits out of there (around the Svolvær/Henningsvær area). Hope that helps and enjoy your skiing in Lofoten! Cheers Paul, thanks for your info. I could quite easily wonder over to the Leknes area if you would be interested in going riding. All this snow has me itching to get out. Are you by any chance going to the splitfest next weekend? Encore une belle aventure que tu nous contes aujourd’hui. N’hésites pas à nous faire savoir quand tu passes par la France avec Madame. Salut mon Jeje! On sera a Chamonix le 13 avril pour une semaine. Je ne sais pas si vous avez la possibilite de descendre? Il faut que j’aille en suisse le dimanche (15 avril) mais a part ca, on sera a Cham….